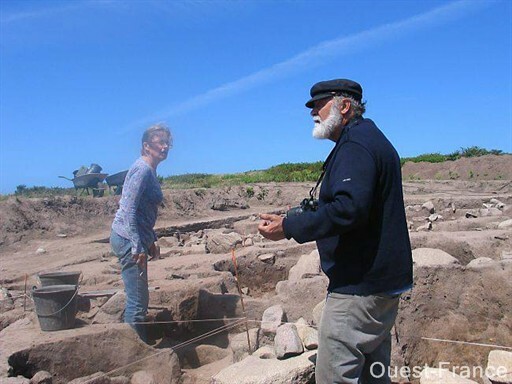 FRANCE – Ouessant - Une quinzaine de bénévoles a travaillé pendant plus d'un mois sur le site de Mez-Notariou, au coeur de l'île. Celle-ci dévoile peu à peu ses mystères. Les fouilles ont commencé en 1988 mais Mez-Notariou est loin d'avoir livré tous ses secrets. Il faut un peu d'imagination pour visualiser les bâtiments en place 750 ans avant notre ère car le site ne comporte que des « trous de calage », que les habitants de l'époque utilisaient pour leurs fondations, à savoir des poteaux de bois. Un vrai casse-tête : deux villages de l'Âge du Fer et de l'Âge du Bronze se superposent, « avec neuf bâtiments et cinq ou six techniques différentes ». Cette année, l'équipe a fait une découverte de taille, un nouveau type de bâtiment. Trois ans pour étudier deux ou trois structures, au lieu d'un an pour six maisons : au fil des fouilles, l'archéologue a fait le choix de la minutie pour ne pas passer à côté de détails importants. Les techniques de fouilles se sont aussi affinées grâce à la photographie verticale et la 3D. Loin de l'image que l'on peut en avoir, l'île n'avait rien d'un lieu isolé et était une escale technique dès l'Âge du Bronze, dans le cadre du trafic maritime. Dans les zones de mer dangereuses, les marins désorientés faisaient parfois appel à des pilotes, des marins des îles pour les guider. Étant donné la richesse du site, les vestiges datent du Néolithique à l'époque gallo-romaine, il a fallu faire appel à des spécialistes. Des chercheurs de l'Institut national de recherches archéologiques préventives (Inrap) ou du CNRS ont donc participé aux recherches. KIRIBATI – Gilbert Islands - Conservation biologist Joshua Drew just wanted a fun project to take his mind off his job search, so he turned to the massive anthropological collections in Chicago’s Field Museum where he was a postdoc. Curious about the relationship between cultural and biological diversity, he focused on sharks and the Pacific Islanders who relied on them. He studied shark-teeth weaponry from the 1800s that was crafted and used by people of the Gilbert Islands, an island chain in the country Kiribati that straddles the Equator. Sharks are an incredibly important ecosystem engineer, but they’re also incredibly important to the culture of the Gilbertese people,” Drew said. His research turned into more than a mere relaxing distraction. After landing a lecturer position at Columbia University, Drew recently presented his findings at the Ecological Society of America’s annual meeting in Portland, Oregon. It turns out the ferocious-looking weapons were made from sharks that scientists had never seen in the Islands. USA – Bridgeton - The wooden steamboat Montana has resurfaced on the Missouri River, thanks to the severe drought. Pieces of the sunken vessel are now clearly visible because of the near-record low water levels. The Montana, built in 1882, was the largest vessel to ever travel the Missouri. It was longer than a football field. The Montana struck an underwater tree in 1884 and was piloted ashore. The boat has been there ever since for the past 128 years. The Montana isn't the only shipwreck visible along the Missouri. But no treasure hunting allowed. All of the shipwrecks on the Missouri belong to the state under federal law. BULGARIE – Sboryanovo - Bulgaria marks Friday 30 years of the sensational discovery of the Thracian Sveshtari tomb included in the world cultural-historical heritage of UNESCO. The Thracian royal tomb near the village of Sveshtari is one of the most sensational archaeological discoveries over the past thirty years in Bulgaria. Perfect as architecture, it amazes both with its wealth of sculptural ornaments as well as its vibrant colors. It is a remarkable monument of Thracian art and one of the biggest sensations of ancient archaeology in recent years. It was included in the UNESCO list over the extraordinary architecture and picturesque ornaments. The site was unearthed during excavations in the historical-archeological reserve "Sboryanovo," situated between the villages Malak Porovetz and Sveshtari ofIsperih municipality, in the river Krapinetz canyon and on the hills around. The tomb consists of a passage (dromos) and three square chambers: ante-chamber, lateral chamber and main burial chamber covered by a semi-cylindrical vault. The plan of the building offers a new interesting example in Thracian building practice. The decoration of the tomb is executed in the spirit of the contemporary Hellenistic architecture. Its entrance is flanked by two rectangular columns (antae). Above them there is an architrave plate with a frieze in relief, consisting of stylized bovine heads (bucrania), rosettes and garlands. Ten beautiful female figures with hands raised high like caryatids are impressive. The figures are about 1.20 m tall, presented frontally, wearing long sleeveless dresses (chtons) tied with a thin belt below the breasts. Two funeral beds, human bones and grave offerings were discovered in the central chamber. From the scattered stone details it was possible to reconstruct the facade of the tomb aedicule - naiskos, consisting of pilasters, cornice and a pediment, and closed with three stone doors. Being places in front of the large funerary bed as a symbol of the boundary between life and death, the aedicule isolated the grave of the deified ruler - the most sacral part of the tomb - from the rest of the place. In the center of the composition the goddess is offering a gold wreath to the ruler, rendered as a horseman facing her. On both sides of them there are processions of servants and armor-bearers carrying different gifts in their hands. The time when the Sveshtari tomb was built (mid-3d century BC) coincided with the period of a great political, economic and cultural upsurge of the Thracian tribe of the Getae. The rich decoration and perfect architecture of the tomb speak for the political power of the ruler. The Sveshtari tomb is part of the historical-archaeology reserve "Sboryanovo" which also includes the Thracian town of "Helis" and the Thracian sanctuary "Demir Baba Teke," along with several smaller Thracian tombs.